Every year the benevolent Erik over at Tenkar’s Tavern runs the “12 Days of OSR Christmas”. This year the theme is slightly different, with those of us giving stuff away running our own giveaways instead of it all running through Erik’s site. So, I’m giving away a pair of Dyson’s Delves I & II in print, shipped anywhere in the world (so don’t worry about the pesky US only rules that some of the 12 days are running under). Go through the blog, find a map that you like. Post a link to the map in your comment to this post. Include how you would use the map in question – something different than what I suggested on the blog. For many maps that’s easy because I didn’t provide much suggestion beyond a description of the layout, but some have nearly full encounters described for them – so give us something different. You can also describe how you already used one of the maps on the blog in one of your games instead of how you would use one of the maps. The entry doesn’t have to be long. Just a quick line or two is all that’s needed, but longer entries are cool too! You can enter multiple times, but there’s a system of diminishing returns. 1 Entry = 1 chance to win. 3 Entries = 2 chances to win. 7 Entries = 3 chances to win. Some time around midnight tonight (or possibly in the wee hours tomorrow morning before heading for work), I’ll tabulate the number of entries / chances to win, and then Jen will roll the appropriate die or dice to figure out who the winner is. If the number of entries is something I can’t easily roll dice for, then we’ll pretend we are rolling on a classic D&D results table and the extra results are “Roll again, ignoring results of X or higher). So let’s say there are 55 entries, then it’s easy, a d11 and a d5 as the control die and we’ve got it… but if there are 57 entries then I guess I could figure out… screw it, roll a d60 and 58-59-60 is roll twice ignoring results of 58+. So, let’s get this going! What map would you use in your game, and how would you use it? Update! – One of the entrants, Chris Stieha (publisher / creator of RND zine) is refusing to win. So if his entry does win, then we’ll re-roll and the winner also gets a copy of his awesome zine! (I’ll actually be posting an article about RND issue 1 later this week). The Old Silo has become the home of the raiding party La Couple, who use it as a base of operations. Down the central shaft is a huge missile of the design of the ancients, its secrets a mystery. Great location for Mutant Future, Gamma World, or other similar games. I loved this map (second only to the “F U That’s why” map.) and used it as a military academy for Royal brats who were taken hostage by a group of evil doers. (Think “Toy Soldiers” with assassins and dark elves). Here is the remains of Bolar’i. A city once thriving and bustling, a popular trade stop in the jungles of Maakar. Dark days came when a massive sinkhole swallowed the city and hundreds perished. The place was avoided being obviously shunned and shown disfavor by the GODs. It lays deep in a crevasse and is inhabited by the elusive and savage white apes. They have claimed the ruined city as their own and will defend it to their deaths. They care little for the remains of what the city was, but it has become a spot for treasure finders and adventurers that there be gold, jewels, weapons, armor and allegedly an ancient set of scrolls that are rumored to be beyond rare buried deep within the city’s temple. I am currently using the entirety of the Darkling Depths as a war ravaged dwarven bastion that is home to multiple groups. I’m using Palladium Fantasy 1e revised as a system and theyve just made it to level 2a as of last night. One of the toughest penal colonies located on this coast. Surrounded by inhospitable coastline and long, open stretches of plateau lead to the one entry point. Run by the powerful half Orc, Papa Jando, this prison is a set sufficient colony run on the blood, sweat and tears of those unlucky enough to serve their sentences there. They farm, and create goods that are sold at markets to fund various costs running this colony. Traditionally, no one sentenced there leaves. This is where evil comes to die and serve its justice, albeit sometimes a perverted version of what one would call justice. These criminals are the worst of the worst and political prisoners of the realm. One of the prisoners is alleged to have information of a plot against the King and his family. It would be quite a test for adventurers to get into the prison and back out again. While Papa Jando is tough and without compassion, he constructed this place to deliver justice. Here is entry one: how the map of the Spiral House (https://rpgcharacters.wordpress.com/2015/05/15/friday-map-the-spiral-temple/) ended up when I filled in the corresponding page in Chris Stieha’s zine, RND. Vortex House was once a keep, built around a magical portal set in the Coal swamp. When the Edgeworlds were thrown into a state of imbalance by some planar catastrophy, the vortex started teleporting to random locations – and part of the building went with it. Today, Vortex House is the roving manse of Botyok the horse-headed archwizard, where he keeps his invaluable collection of artefacts. This is a map of Volcadia, the first city of the lost lava kingdom. Back when the inner planes collapsed onto the Prime Material, a group of magmen refugees decided to dig a refuge under a volcano. But they couldn’t know that a large chunk of the plane of Water had merged with the mountains a few leagues north of there. It took a few years for the rivers to appear in the underground. The city was flooded, the volcano went dormant and the whole region was turned into a steam-filled wasteland. Now that it has become livable again, people are wondering what treasures are left in the basalt halls of Volcadia. facing a clan of Bugbears, plus a few other creatures. I’ve added a few doors between chambers and a few traps to give the Rogue some activity. I also added an outside area with fortifications and traps, with a clue that there are multiple entrances to let the rangers use their outdoor skills in finding an entrance. I just want to say I think your maps are beautiful and have copied your style when drawing my own maps. Egypt, 1936: Mack Stanton and his team of intrepid American and British explorers were leading in the race across the Libyan Desert…until their customized desert-equipped truck started having radiator trouble again. They had just enough water to head for that landmark on the horizon. But they found a long-forgotten pyramid with what looked like a well nearby. Can they find enough water to restock their supplies and fill their radiator? Will the pyramid’s deeper chambers tempt their sense of adventure? Can they find water before the competing German and Italian teams catch up with them…and possibly claim the discovery of a new pyramid for themselves? I used this map as a temple of a fallen god. My PCs had to traverse a swamp where the sun did not shine for 3 days to get to it. When they got to the temple the place was riddled with animated skeletons calling for their master. The PCs finally escaped a horde of skeletons after the fallen god helped them out by stopping time just long enough for them to make it through the horde. They suffered a few broken bones, but did manage to retrieve the grimoire that they were sent to find. I was thinking of using this one with my own 9 yo – he & I have been talking about adventures involving a band of kids, and I thought Goblin Gully would make a terrific secret headquarters/clubhouse – once the current obstructions and occupants had been dealt with, of course 😉 A mish-mash of Indiana Jones & the Last Crusade, and the Goonies, has been pouring through my head – if I’d had more warning of the contest, or more sleep, this would be more coherently laid-out. But thank you, Dyson, for your always delicious maps. They – and the tabletop tiles of the magnificent Inked Adventures – bring me joy, and encourage me to share the hobby with my boys! In the Sanctuary of the Flaming Tree of Glass, the monks of the dragon cult wait for the time when they can avenge their loss against the butterfly cult. Vonegaar’s Crypt was once a cave complex. This is where man’s ancestors sealed the first demonic pact. Eons later, some of the power from this ritual is still lingering in the crypt. The back cave has been left untouched because of the horrible visions plaguing whoever spends more than a few minutes there. If a portal to Hell was ever to be open, this is where it would be. 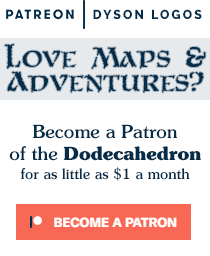 The pentacle on level 4 is where Vonegaar the demonist confers with the most powerful denizens of Pandemonium. He has his guards (who live on level 1) drop sacrificial victims into the pit above so that he doesn’t have to come too close to the circle. Vonegaar lives on level 2, practices magic in his lab on level 3, and the level 4 room leading to the haunted cave is used as a guest room when the Empress visits. This is the inside of the skull of an ancient behemoth, which was recently exposed after a landslide. The inside was carved out by a sect of worshipers of the now-extinct creatures. The island in the sky thing would be awesome as a smuggler’s spaceport for Spelljammer. At least, the neogi think so. This is a great map representing a crossroads of a former trade route that has fallen in disuse. 30 years ago caravans camped nightly around the Inn and trade post in the center under the watchful eye of the guard tower. The silver mines to the north ran dry and main trade moved to another route.The inn collapsed after a fire in the basement and the soldiers in the watch tower were reassigned years ago. Now only a hermit priest inhabits the ruins of the church on the hill. The ruins still serve occasionally as the camping point of a caravans that still brave the old route despite the rumors of bandits. Of course adventures have reasons to travel north to the old mines and this crossroads would make a good base of operations. They can resupply from the infrequent caravans and with little repair the watchtower serves as a secure camping spot. Can they trust the hermit? He is a good source of information, but is he an ally or threat? And when the caravans start going missing the players have motivation to investigate if they want to keep in supplies. I’m picturing Christina’s Caves (https://rpgcharacters.wordpress.com/2015/11/27/friday-map-christinas-caves/) as the top of a mountain–a series of narrow ridges and wider landing spots. There is a mysterious air current rushing through the peaks that might send people or things flying over the edge, and the molten lava causes an updraft that with a little bit of cleverness might be strong enough to carry a party up to the cloud castle above. The defenders of the castle are on the ridges, well armed with missile weapons and ranged spells. I’d use this as the headquarters of a tribe of sentient dung beetle men. The mound is actually a huge pile of feces left behind from when a gigantic monster or Titan had a bowel movement ages ago. The dung beetle men are gradually expanding their headquarters as they consume the poo, making room for the generations of dung beetle men yet to come. Naturally, characters adventuring in this environment will need to save versus Poison or make Constution checks on a regular basis to avoid getting sick. Might sprinkle in some giant flukes, pinworms, or tapeworm “guard dogs” for good measure. I have a floating continents in the sky world for my own campaign setting and something like this could be really cool as a pirate haven or outpost. Farfinkle was a wizard of small renown and a great love exploring the magical arts. After finding a book of ancient lore concerning other planes he delved a little too far. Opening a gate to another world Farfinkle greeted another being into his world. Sadly the creature saw things differently and ate Farfinkle. The creature, a Grell, now lives in the upper part of the tower.A few local monster have since moved in. Have been subjugated by the Grell to further it’s plan of creating a portal to it’s home plane. The sorcerer Oughdantia Ing was always a secretive, paranoid individual. He built a small tower on the outskirts of the city-state, but its main development was an underground complex extending several levels. So, when the city-state was attacked by a gnoll army and their battle-priests, he took the event as a clear sign of the end-times, blowing up his tower and retreating underground. Here, raging in paranoia, he holds his family hostage, served by a few fanatical retainers. He awaits some undetermined ‘sign’ that it is safe to return to the above-ground. However, his daughter has been courted by a young city-state lord, and now that the gnoll army has been dispersed, he has become increasingly concerned about his love’s disappearance. He hires our heroes to seek out the sorcerer and reconnoiter the situation. The PCs may infiltrate the complex, attempt to neutralize guards, preferably avoid the mad sorcerer, and rescue his besieged family. Alternatively, they may establish a ruse, attempting to convince the madman that it is safe to return to the surface. Evidence found in the ruined tower may help define what ‘sign’ he is awaiting. Recently started a GURPS campaign based on the S.T.A.L.K.E.R.S. series of computer games. This map will be used as an abandoned research station that the players find. Who knows what horrible mutant will be still living inside. Or, if you know the last game in the series, Call of Pripyat, been thinking about making this the home of the Oasis. I also added a couple items to the mines, including mine cart tracks in the main, straight corridors, that lead to the elevator room. There are small sets of three rooms in the southwest corner and on the east side of the map. The inner most of these became “cave-in rescue” rooms, with some minor magic to create food and water and heal wounds. The PCs appreciated these small respites from the sneaky ghouls, once they cleaned out the remains of the dwarves who had barricaded themselves in. 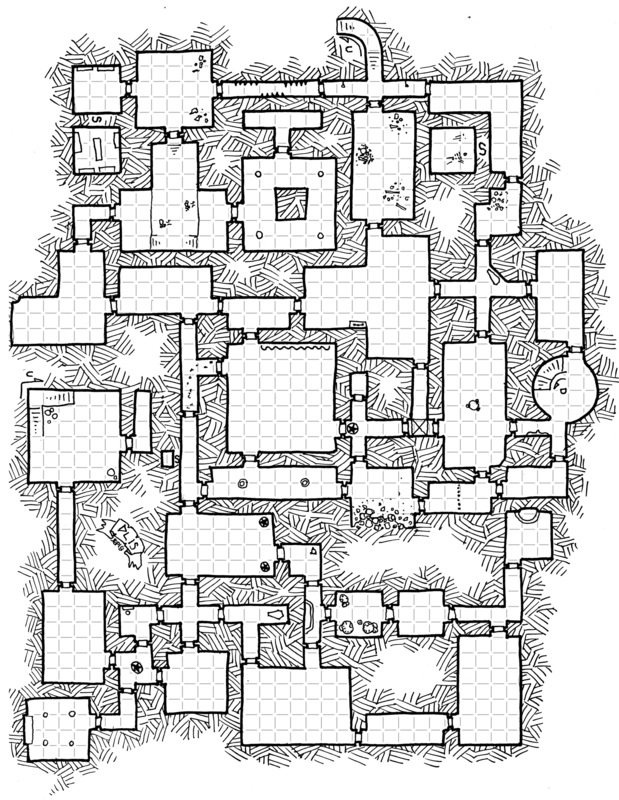 Erdea Manor (https://rpgcharacters.wordpress.com/maps/erdea-manor/) became a ruin underneath a castle, filled with little demons. If the players weren’t so worried about getting out (they didn’t have most of their provisions, but strangely had their weapons), they might have found the b^^^^g in the 4th level. It was in a Lone Wolf adventure. The bridge to pass the river was misteriously broken so the heroes needed to find another way to continue their journey. So the went to the north for a mile and found the entrance to the dungeon. They went into and discovered an strange tree that infested the insides: its branches were like stone but still alive. There were throughout the tunnel. It can drain the life with them but it has one weakness: its branches are slow. It is like a vampiric tree… Anyway it wiped out the idilic life of the gnomes who dwelt there. It is situated in the black spot of the map. There was also two dhaxes lurking by the corridors. Nice place to go! Wisps of smoke rise from the chimneys of this village, making it seem from a distance to be yet another remote forest hamlet, one among many in the area. However, it will soon become obvious that something isn’t quite right. Nothing moves within the village, and it is utterly quiet. While that by itself is not unusual, to have smoke rising from the chimneys is very odd. 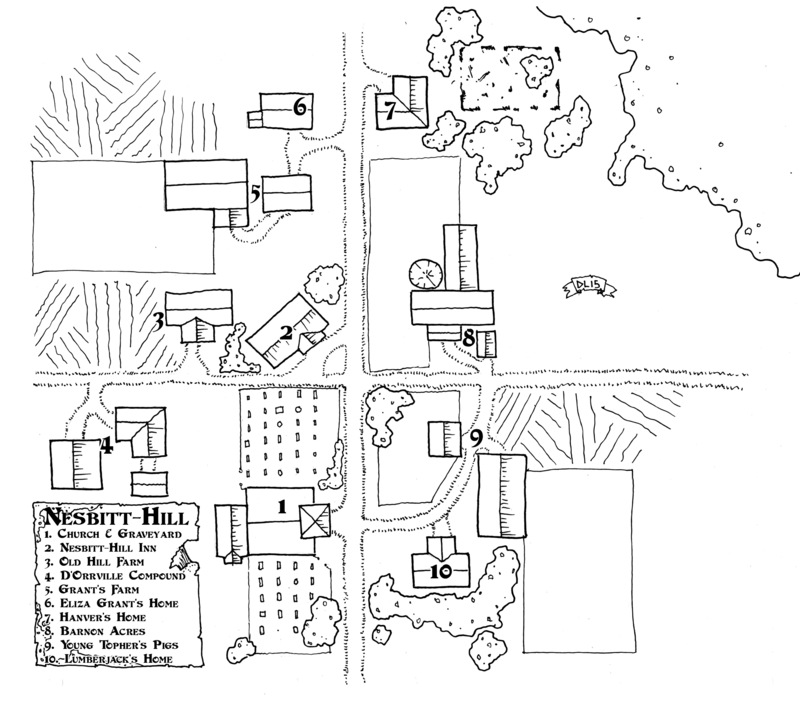 What is The Horror at Nesbitt-Hill? A lone plague survivor has gone mad, refusing to believe that the rest of the village fell to the plague. Elisha Hanver, a man of many talents, retired to Nesbitt-Hill after a short adventuring career left him wealthy enough to settle down. One of his talents is taxidermy, and he has made full use of it to make Nesbitt-Hill seem “normal.” Or what passes for Elisha as normal. MAYOR: Welcome to idyllic hamlet of (rolls dice) South Bumpkin – of the Great Bumpkin Municipality, three carriage hours north the lesser known Bumble Flats: a sleepy crossroads between nowhere and somewhere where retired adventures go for their farmer’s market and antiquing needs. It holds little in the way of intrest for and less in the way of treasure save one. Delicious. Thing. Nine months after the Good Widow Margret’s Wake of a Thousand Jubilations for her ill-fortune’d sixth husband Stumpy South Bumpkin has been blessed with a succulent, juicy, BABY. King Torg (ALL HAIL KING TORG!) commands that the baby be fetched in time for Vor’s Big Angry Feast on Vor’s Big Angry Day of Big Angry Jubilee. King Torg (ALL HAIL KING TORG!) further commands – and warns, in the strongest possible terms – that the baby be returned to the warren intact and un-nibbled upon. The King (ALL HAIL . . . wait, do we have to do it this time?) also warns – well, more mentions in absent passing – that today is South Bumpkins Seventh Annual Antiquing & Adventuring fair so there might be some retired hero-types walking the streets. He, that is King Torg (ALL HAIL KING TORG) is sure you’ll manage somehow. Or not. He doesn’t really care. Now, Kobolds; go (don’t) eat that Baby! And ALL HAIL KING TORG! No one quite knows where they came from, and the story of their disappearance is even more mired in myth and intrigue. Poised above the town, on cliff that would better suit a keep, sits an ancient monastery rumoured to once belong to an order of Paladins. There are stories that beneath the monastery are a network of tunnels and passages that contain a treasure unfathomable to mere men. Some have attempted to find the access point for these tunnels, but the stories say that anyone who enters into the monastery is never heard from again. It has been several centuries since a living soul has set foot inside the building. However, many non-living souls are said to reside inside. Lately strange happenings have been occurring within the monastery’s walls. Lights that were never seen before wink in and out of windows. Sounds of machinery and torment are heard wafting down the cliff face. Mounds of dirt and debris seem to be dumped over the end of the cliff during the small hours of the mornings, causing damage and death to the town below. The Pool of the Dark Dancers was once an idyllic glade nestled deep in the wood. At night, under the moon and stars, fey folk would journey here to bath and dance and worship the Goddess of the Night Sky. But something fell and savage happened during one of the revelries many years ago…and the pool and its chambers have become a place of mysterious evil. Can the adventurers solve the mystery and restore the pool to its glory once again? I used the cave portion of this map as a hideout for some dragon cult kobolds guarding (poorly) a dragon egg. Conroy’s Caves have long been the home of a copper dragon. The dragon is treated as a local deity by the area’s residents, who often journey to the dragon’s labyrinth to as advice or request boons. Accordingly, the dragon has a taste for certain relics or past dynasties, and is known to send those of an adventurous nature on quests for those rare items. The outer cells of the labyrinth have been colonized by a small gnome clan who act as acolytes for the dragon’s cult of personality. A shrine and mausoleum in the depth of the caves, across the subterranean river, is home to a ghost who the dragon befriended in its youth. The ghost, with its connection to immaterial planes, is the real ‘oracle’ of the caves, using the dragon as a front. The ghost requires the collection (and destruction) of dynastic relics to prevent a prophesied resurrection of an accursed despot. The settlement of Appletree Pond is surrounded by its namesake orchards, and a welcome respite for travelers arriving from the Eastern Wastes. The Pond is home to a local curiosity, a giant pond turtle. The turtle is generally harmless, and is apparently centuries old. No one is sure how it arrived here, since the closest similar population is over a hundred miles away. It has several curious marks on its massive, horny shell. Locals and visitors speculate on if they are ancient sigils, or merely deformations in the shell. The turtle doesn’t care either way, but particularly likes heads of cabbage thrown to it. The local lord lives in a small manor facing the lake. He is a simple man, happy tending to the orchards and chafes at his assigned duties of providing constabulary to patrol the roads east. A priest of the settlement has built a modest chapel and ministers to travelers and the locals. While outwardly jolly, he harbors secrets of dark crimes committed in one of the Kingdom’s cities. He spends his nights in guilt and self-flagellation, fearing the eventual knock on the door by the high cleric’s inquisitors. The town inn, the Sacred Turtle, is run by a pair of halfling twins. They enjoy dressing identically and answering to the other’s name so much so that they have become slightly confused, themselves, on which is which. On the other hand, their sausage-filled travel-bread is a boon to travelers journeying back to the heart of the kingdom, or further east into the inhospitable Wastes. 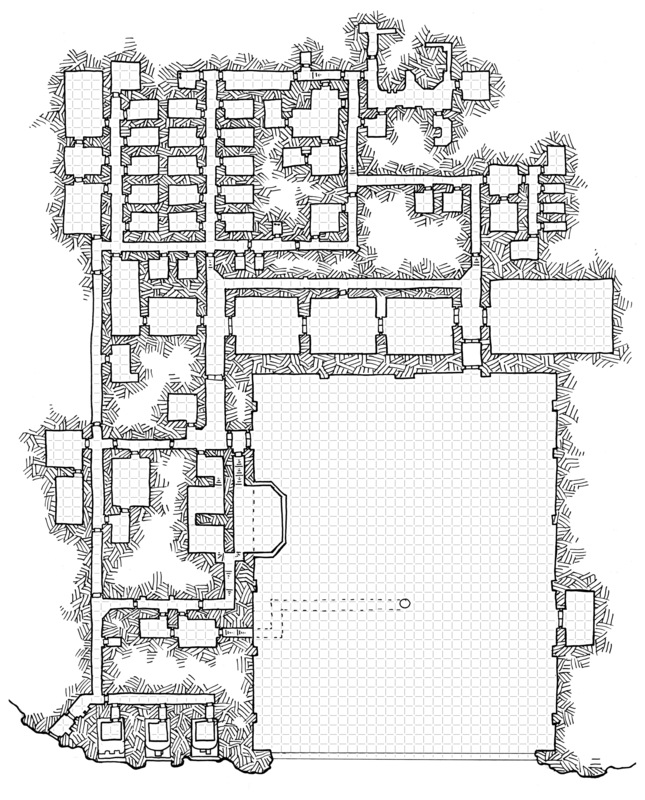 The city of Dolem’s Spire (https://rpgcharacters.wordpress.com/2014/06/17/tuesday-map-dolems-spire/) is the setting for an upcoming campaign in which the PCs will be members of an up-and-coming thieves guild, planning capers and trying to avoid the attentions of the established but way-too-comfy Company of the Black Hand. 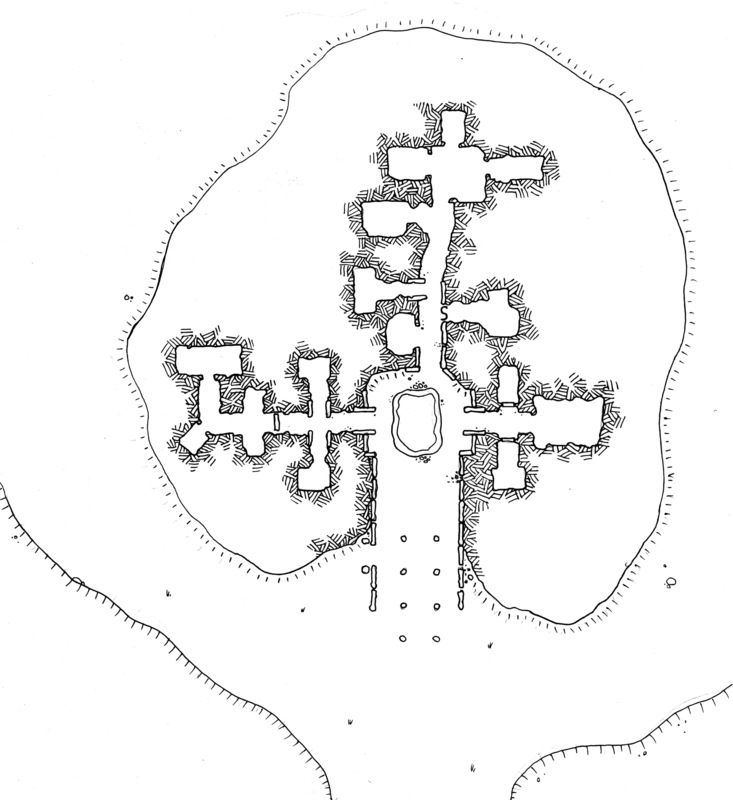 The fortress on the spire has been abandoned, and the town is ruled by a merchant’s guild (located in the old palace on the west side of the city) and the local temple (on the north east). The blank spots in the section of the city just south of the fortress are the sites of recent fires and uprising which have been brutally put down by the town guard. 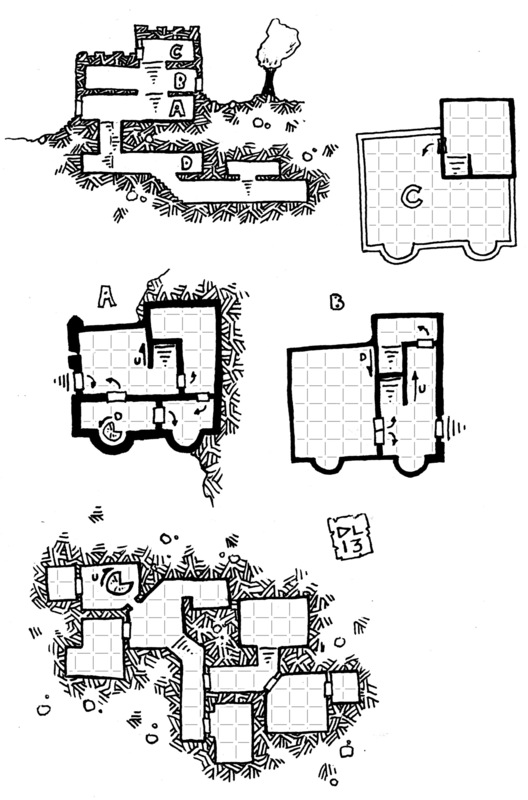 Kreland’s Ford (https://rpgcharacters.wordpress.com/2010/01/08/friday-map-krelands-ford-a-fantasy-town/) was the town were the PCs met the hag covey. One hag ran the Four Javelins Inn just east of the ford, while the other two lived in the house nestled in the woods on the south east side. Tunnels (very damp and haggish) connected the two buildings, and a bound stone giant lay buried alive in the woods near the hags’ home, awaiting transformation into a hideous monster. The townsfolk went about the town, oblivious to the evil in their midst, as the hags preyed on the travelers that came through taking advantage of the river crossing and the “hospitality” at the inn. After leaving the ruined dwarven halls of the mega-delve, my PCs are on their way to confront an ancient dragon. I’m using a modified version of Gruthren the Excessive’s halls (https://rpgcharacters.wordpress.com/2014/07/11/friday-map-the-great-hall-of-gruthren-the-excessive/) for the dragon’s lair. The northern main chamber has been widened out, with a larger room at the north end. The stairway at the southern end has been widened as well, and is the main entrance into the complex. The dragon lairs in the northern chamber, while various minions live and work in the surrounding corridors. The dragon has been known to visit the other chambers in human form. Hey Dyson! Eric here, I’ll give this a shot. Rumors speak of a strange alchemist who delved too far in terms of creating new, and exciting beverages for the wealthy to quaff at their posh parties. Stories speak of alchemist Bean whom created hot beverages that replenished vigor and erase fatigue for those in need, yet as the rich do, they tire of new discoveries quickly, and soon Bean spent a small fortune trying to rebuild his waning, and demanding clientele. Many a great discoveries were said the have been made, yet all who joined into the escapade go made, and never survive intact or at all. The main cavern houses his equipment, papers and ingredients strewn across the floor, along with bodies of failed experiments. Those who unfortunately find the true lab found underground, where the rejected experiments are found, are forced to face the darkest emotions that humanoids can experience. When one opens a door to one of the cells, a surprisingly large amount of liquid washes over everyone in the hall. The still lukewarm leftovers of the alchemists invigorating beverage are magically instilled with the essence of raw emotions. Fear, Loathing, Greed, Lust, Anger, Sloth, Paranoia, Vengeance, Gluttony, and Delusions of Grandeur. When one comes into contact with the liquids they seem to go unconscious to the normal eye, yet in their minds they are trapped and forced to face the fear they’re affected by. Either by themselves, or get magically linked with their fellow adventures as they themselves are affected by the emotion, or face others who are. There are some worthy loot, and discoveries that can be made by venturing, but is your mind ready and willing to be tested? 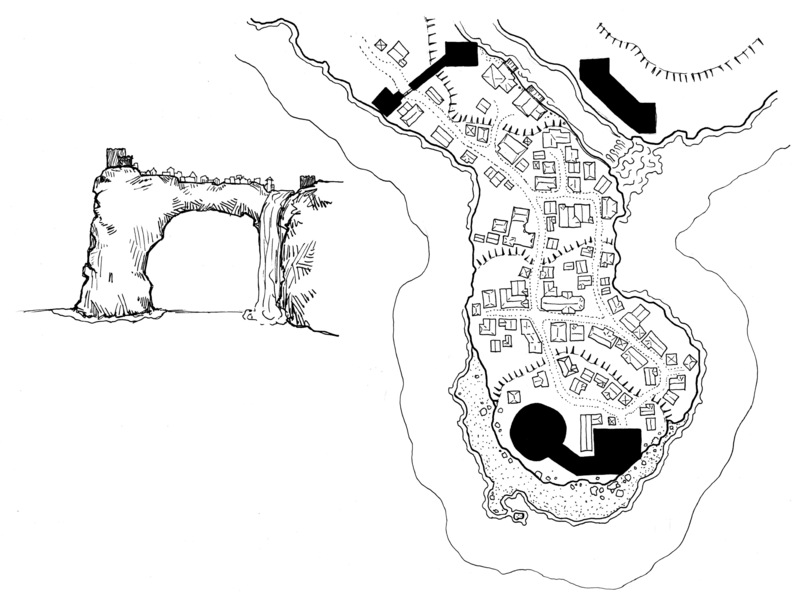 The Kabus Retreat (https://rpgcharacters.wordpress.com/2015/05/12/tuesday-map-kabus-retreat-the-monastery-in-the-mists/) is going to be the entrance to the dragon’s lair, via a backdoor in the top-most level leading into the caves from where the waterfall comes. (The dragon can simply fly out the cave mouth.) Dragon cult priests inhabit the monastery. Dyson, thanks very much for all your work on the maps. You have inspired many of my adventures! Thanks also for this lottery. I’ve enjoyed revisiting the maps and seeing what others have done with them. I got the news this morning: finally my father died. After nineteen years, I am riding back “home”. Will the castle be as I see it in my nightmares? Who will have survived of those I knew, if any? I like the idea of using these Morphs for small mining outposts on asteroids. Just add an airlock to the outermost portion and your players can try to open the door and find out what awaits them inside. This one was used as a crashed, long buried rocketship for my Mutant Future game. It was awesome having the players slowly realize the nature of the “dungeon” they were sent to explore. Before the War between the elves and the dwarves, when they were loosely allies, elves valued the precision craftsmanship of the bearded dwarves. Kargin’s clan was valued for the orbs of polished wyrdstone. The elves used them in rituals that peered into the heavens that allowed them to study the stars. But the elves discovered that their study had an undesired aspect: the studied objects would draw closer to the Astronomancers until they literally fell from the sky enveloped in fire. The elves turned to the dwarves and the clan Kargin to destroy or guard to orbs in perpetuity from Chaos that would use the power of the rituals to as a weapon or worse. In time however the clan would forget their charge. The halls that held the orbs would be lost to time. Yet the powers that would be drawn to their lore as a tool of destruction or as raw wyrdstone would never stop seeking the orbs. This great hall is one such tomb of an orb. Built to house the guards and an orb deep behind magical and physical defenses. I used this map and other in a multi year campaign built around this very homegrown lore in WFRP. Could be used as a bare bone keep with a large inner yard with a shrine. Might be an ancient knight order, very religious. I’m going with the Asteroid Base. It’s an awesome map for a base, prison and I’ve used it in Star Wars and D&D games. Regardless of winning, a HUGE thank you to Dyson for all of the amazing maps and content. Every post inspires me in my games and creativity. This would be a good small fort for a party to overcome and claim as their own as a base of operations. I’d probably stock it as a typical bandit or goblinoid lair – not a lot of treasure to claim, other than the lair itself. I like to occasionally put one of these out for my players, and usually build in a “defend your lair” scenario at some point so that they have to put some effort into developing the place as their own. This is a great map for an archive out in the dessert somewhere. The underground portion is where the older documents are kept, safe from the burning sun above. The chambers built into the wall are the various chambers in the scriptorium, for making new texts, for binding old books (and scrolls) and so forth. The main building serves as a reading room for those brave enough to make their way to this distant place. This will be the map for the center of a small hamlet about three days out from the main town of my local campaign area. It will obviously be ‘terrorized’ by a manticore who comes in monthly to eat. I plan to use this map in my own zombie RPG as an abandoned hospital in the city of Ensenada México, the place used to be a CDC tower in the middle of the city and the players are headed there to loot medical supplies. Last autumn, I started a 1e/2e campaign with 2 of my best friends and their sons (6 players total) and started with, drum roll please, B2 Keep on the Borderlands. As the party cleared out the Caves of Chaos, I was busy modifying Cooper’s Hole as the dreaded Cave of the Unknown. I had one of the collapsed passages connect to Temple of Chaos and populated the “Hole” with a very young, small green dragon (as well as a few other things). Unfortunately, the party went elsewhere and thus I have an unused, partially completed encounter area! On a brighter note, I almost got a TPK while the party was in the Caves. However, upon investigation, they found the courtyard littered with a large number of very lifelike statues, and acid-scored stone on the walls, especially in the rear outbuildings. The party began investigation the left most building and discovered some kobold scouts, who quickly retreated across the bridge walkway. As they closed the door behind them, the last Kobold through struck a small gong, which awoke the Dracolisk hibernating in the right rear building. One party member immediately fell victim to its gaze and turned to stone. The others retreated into the building as the beast landed on the stone bridge, collapsing it. They were now stuck in the building with the Dracolisk hunting outside, too big to enter through the narrow corridors. Finally, after much debate, the elf screamed “Save yourselves,” gathered his halberd, and leaped from the bridge, trying to attack the beast below. While he rode the back of the beast, his pole arm stuck in its armored hide, the other party members joined the fray, and after a lot of really poor rolling on the dracolisks part, and really good rolls for the party, they defeated the beast without losing any more party members! Assassins Training Compound. Enclosed (and private) proving grounds in which discerning assassins can practice their craft. Loaded with an ever-changing menu of real world traps and diversions, the compound is the ideal place for a Guildmaster Assassin to train or test his low level members. Target’s in the hut, getting in there is the problem. The big circular area to the north is not a room, but a pit, diving strait into the earth for hundreds of feet. When you reach the edge of it, you see four chains hanging down into the darkness from somewhere high above. Each of these is suspending a cage far below. Each cage holds an imprisoned mage. All of the makes hate each other and will do anything to escape. The mages have been here for centuries, but think it has only been a day. This is because their cages are actually the weights of an enormous clock-mechanism, ticking away in the darkness overhead (climbing a chain to the top reveals its inner workings). At the end of each day, the clock rewinds time in the dungeon 24 hours, preventing the mages from ever fully hatching an escape plan. It’s up to the players to discover how long they, too, have been down here. Scrolling through for inspiration, I immediately see the surface level of the garden as the former home to an order of warrior monks. Defensible but designed to allow them to observe their vows. The four crypts are re-envisioned as meditation/penitence chambers. This is the Dungeon of the Anti-Arch-Magus-Mage Tim. Every single room (except one of the smaller ones on the left which is a privy) is dedicated to vile experimentation and even vile-er privation wrought by the Mad Tim. Many of the byproducts of these experiments are not too keen on visitors but it is said that besides a horrible and messy death, riches can be found by those stout of heart and strong of stomach. All players start with blank sheets, with only the player name filled in. The party wakes up in the main bedrooms on the third floor with no memories of how they got there or who they are. They feel a sense of unease about heading down the stairs, and should be prompted to introduce themselves and make names. As they progress through the second floor they encounter hostile, ghostlike figures that attack them on sight. Some of these phantom apparitions are young, and hiding in closets, under beds, etc. They can’t open the doors to the outside, nor any windows. As stats are used, they are rolled on the spot as the players discover what their characters are good at. Improvised weapons can be found in various rooms, created by the players and statted by the GM. They feel a much sharper sense of unease for the next set of stairs. On the first floor, they face the remains of a gathering/party and more significant resistance from the ghost figures. 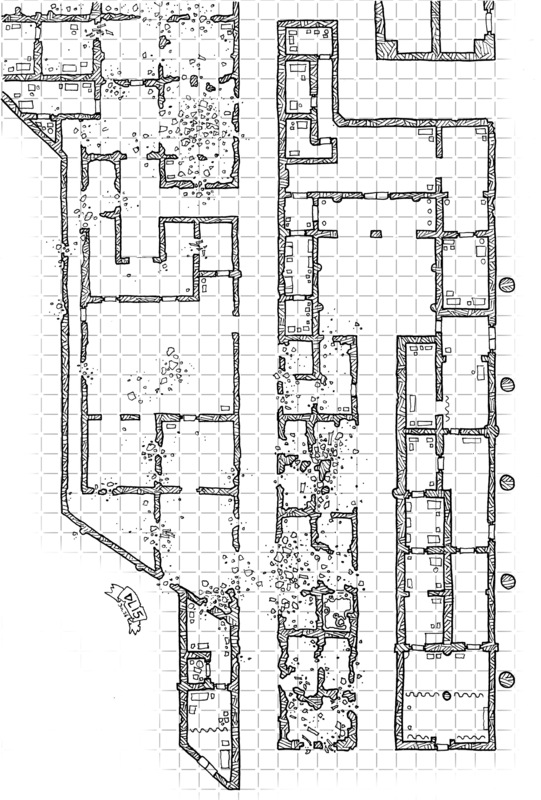 No egress may be made, but the debris leads them down the corridor to the side wing, where a ritual has been performed, and their corpses lie around a summoned demon. They are the severed souls from a ritual to summon the demon, and all the “ghosts” their former compatriots now fighting the demon and them (not recognizing them and seeing only phantasms). There they can do a variety of acts: declare the house their own (creating a haunted mansion that they are the undead owners of), strike a bargain or defeat the demon to return their souls to their bodies, or the third, unknown and unpredictable option that some tables will come up with. I’m picturing Edwardian/Spiritualism in tone, possibly Hellfire Club, but it can go classic fantasy or even modern. Due to the nature of the game, I would likely have their stats be 1st level, but have a touch more HP (adjusted for whatever system you are using), or have them constantly healing at a low level as long as the demon remains summoned. A nice one-shot for an evening. An old orcish outpost that flooded when its outlet plugged. The orcish inhabitants tried to get out, but finally succumbed to the rising tide. Their bloated bodies walk the halls now, always looking to get out, but never finding a way. That is where the cleric Ascergh found them in his moment of despair and it was around them that he thought to keep his part of the great secret safe from prying eyes. He set up a ward to keep the lowly undead away and he and his servant fashioned a home for themselves over a walkway. The cultivated the silver Thork as pets, protectors and food. They lived the life of simple hermits. Time though, chafes, and holding a great secret makes it grind even more so. Ascergh, in the fear that developed in his mind thought to make himself more safe and so created a man out of the clay in the pools, but even that was not enough. So when his servant lay close to dying he thought to keep his servant on this plane and he made him a thing of undeath, a thing of fear and flame. Even more time past and Ascergh knew his day too would come soon, but he still had the great secret to hide and keep safe. So powerful was his will that he did indeed die, but he noticed it not. He moves still, driven by sheer will and hate of what he has become. The chosen one came, to take his burden, but Ascergh slew him. So now he waits for time itself to end. A clerical Lichof unmitigated evil, with terrifying servants, surrounded by gurgling drowned orcs in his cave gaurding a great magic he cannot now even touch. That is how I set it up and used it. The great secret was part of a larger quest (still on going). It was fun to drag out the Fiend Folio for the Thork and the Eye of Fear and Flame. For the drowned orcs I used a book from Pathfinder http://www.d20pfsrd.com/bestiary/monster-listings/undead/orc-floodslain adapted to 5e. The Thorks a set so when the party tries to get across the bridge in the bottom (headed to the right) they are in the waters with clear shots to soften the party up for the final battle. Aproached by a halfling with a map for sale to the ruins of an old keep, the players later find the map to be something that has been made and sold many times(the paper was indeed old but the ink was much newer). 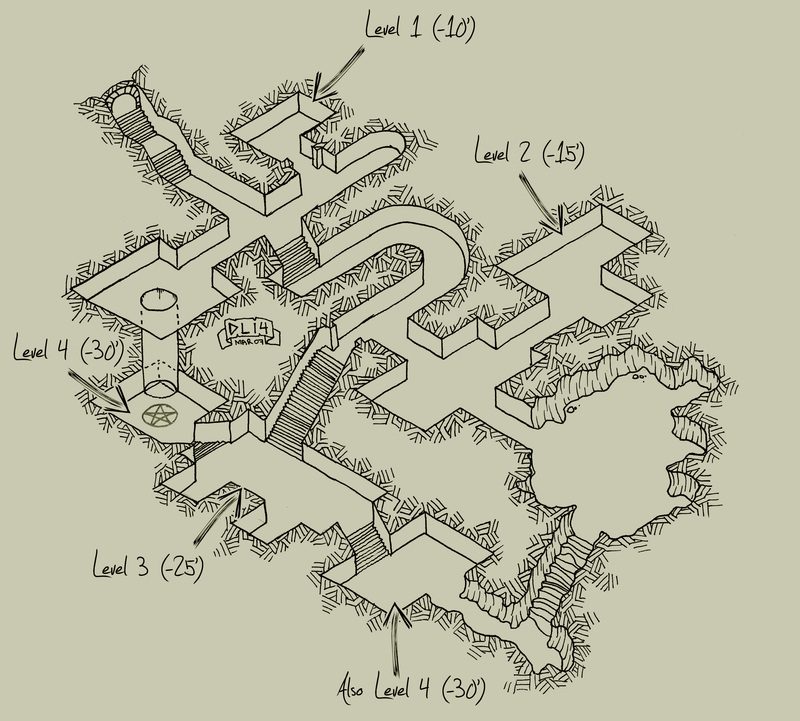 Should the players investigate the ruins they come across well looted keep but also find a well concealed entrance to a large network of rooms and caverns that has gone undiscovered. I used this map as the underground part of an ancient thassilonian fortress in the Mierani Forest in my pathfinder game, playing Second Darkness. This place was infiltrated by drows through a big fissure in the third level. While the elven army storm the fortress from the surface, the PCs group infiltrate through a secret entrance in the second level (the stairs at the left), to surprise the leaders of the drow before they can retreat to the underdark. Was a lot of fun. I see the north stairs of this map leading up to the surface and the top half being a kind of reception area for a cult whereas the holy of holies is kept in the shrines in the lower half, including some sort of fungus garden which is keyed to their worship. The cult is afraid of whatever lives in the level below and is accessed buy the large spiral staircase in the east – hence the pit trap, guardian statue and barred room. The central rubbled room behind the bars may be a result of a previous encounter with the beasts below – suggesting powerful magic, breath weapons or limited stone-disruption powers. I’ll be posting the winning process and winner in an hour or so, and then next week I’ll head over to the various maps and will be adding your commentary and new usages to them so other people can enjoy the breadth and depth of your ideas. I love having the layout for a port city all done like this with no labels. I’m currently running my daughter through an underwater campaign and this will be perfect when she visits a large port city. Devon was a wealthy nobleman with an interest in philosophy and esoteric beliefs. He had the hall constructed in the hillside of one of his estates as a meeting place for like minded people and the complex gradually expanded, adding shrines to various obscure gods. When Devon was killed during the Kinstrife Wars, the complex was first abandoned and then taken over by refugees. Who knows what has happened to it now?